How to choose your garden loppers? Garden loppers, are a world away from pruning shears. But my guidelines and recommendations remain the same. 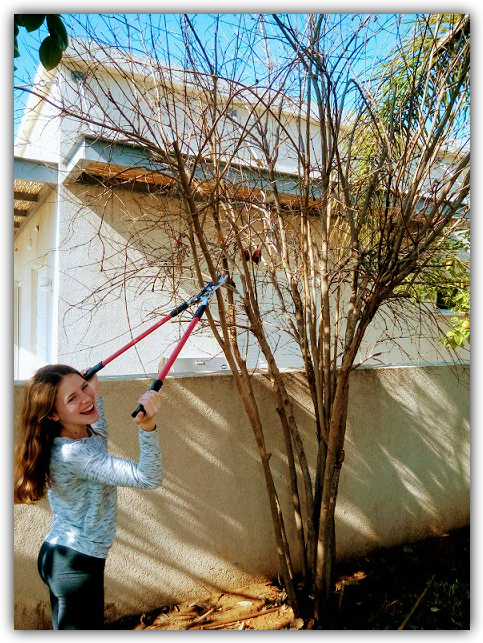 If you have already read my "How to choose pruning shears" page, then you already know that when it comes to working with hand tools in the garden, they must be easily handled by my 13 years old daughter or my 92 years old grandma. And they must be simple to keep and maintain. Now let's see how we keep those guidelines when it comes to loppers too. I took this photo because I wanted to show you something. I think I can safely assume that most of you aren't 6 foot tall, with strong hands, and 22 years of landscaping experience. And if you're not, these anvil loppers will be too heavy, and with an opening range way too large. Plus the cutting point is way above the average man's hip height. All this means you would have to use all your strength, while at a strange angle, to make the cut you want. Not very practical. So now that you understand what you should avoid, let me tell you what you should look out for. Tip #1: Light weight. First of all, light weight is always better. But when it comes to garden loppers it's even more important. Mostly because what you will be cutting will generally be at a height between your hips and shoulders (higher than that is a different story), so, make it easy on yourself. Tip #2: A simple mechanism. Avoid sophisticated locking, self-oiling loppers that make you coffee… the fewer the parts, the better. They are also much easier to maintain. Tip #3: Stainless steel. These will simply last longer. Good high quality loppers will serve you well for years to come. Tip #4: Long blades. This isn’t a must, you can always move stems out of the way with the other hand. Although for pruning roses a pair of long blade shears will be very useful. Then again, you’re probably not cutting roses all day long. So, long blade shears go in the ‘nice to have’ category, but definitely not a must. Tip #5: I believe you should keep it simple, so it will be simple to keep. This means that when you're looking at product specifications you mustn't be blinded by the loppers capacity to cut through 2.5” branches, it very much depends on what it is you’re cutting. Safety: If at all possible avoid using garden loppers that have a banded grip. This is a common injury, and you can't blame the blades this time. 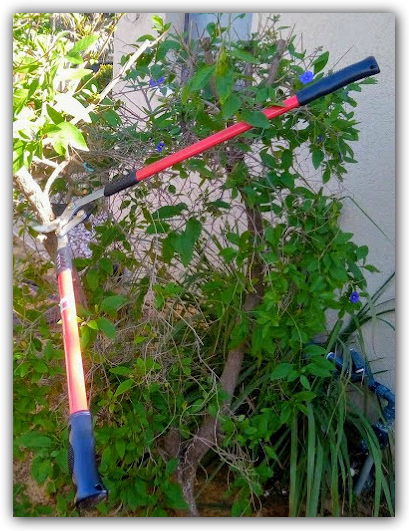 When pruning with loppers, we always aim to get as much leverage as we can to make the cut, and we use both hands holding the edge of the handle. At this point, using maximal power, as soon as the cut's done all the energy go's in one direction, right to your hands which are holding the handles. Now imagine them coming together with a force - believe me, it hurts. And sometimes is even dangerous. Bottom line, look for loppers with good bumper shock absorbents. In 22 years of pruning, I have handled hundreds of hand pruning tools, and I only use 3 pairs on a regular basis. That's right THREE pruning shears in 22 years. They simply served me so well, I had no reason to buy any more. Here is a list of my favorite garden loppers - All tried and tested by myself and my loved ones! What you'r about to cut? "Hi folks, I really like to save you money and frustration, unfortunately, I come across many of you garden owners who think that they bought garden loppers for certain job but in the reality, they didn't fit what so ever. buying expensive loppers and breaking the grip or losing the blades after several cuttings because you chose the wrong pair for the job is unnecessary and frustrating. I invite you to send me a picture of what your planning to cut and I'll recommend the best options for you. I would usually recommend two option (low and high price) but with the best confidence, they will serve you well on your demand. unnecessary please feel free upload picture of your project and ill respond ASAP'.